Kinston, North Carolina - Fans of the Down East Wood Ducks will have a chance to see their pet on a specialty jersey worn by the Down East Wood Ducks during the 2019 season. The Pet Photo Jersey, sponsored by Piggly Wiggly Fresh Buy and Nestle Purina, will be worn by the Wood Ducks as part of Pet Appreciation Weekend taking place on Friday, April 26th and Saturday, April 27th. The Wood Ducks will select 100 pet photos that will be displayed on the jersey. Fans can submit their pet photos by email to akay@woodducksbaseball.com. Submissions are already being accepted and will continue to be considered until January 1st, 2019. One lucky fan that submits a photo will receive 4 game tickets to Saturday, April 27th game and they and their pet will get to throw out an Honorary First Pitch before the game, compliments of Piggy Wiggly Fresh Buy and Nestle Purina. In addition, an auction will be held during the two games so fans can bid on an autographed game worn jersey. Pets are welcome in Grainger Stadium for the Saturday, April 27th game (sorry, no pets on Friday April 26th due to post-game fireworks) so the jersey auction winners and his/her pet will get a chance to meet with the player on the field after Saturday night's game when they receive their jersey. "We are really excited about the Pet Photo jersey and the opportunity it gives our fans to get their 4 legged family members involved with the Wood Ducks", said Wood Ducks General Manager, Wade Howell. 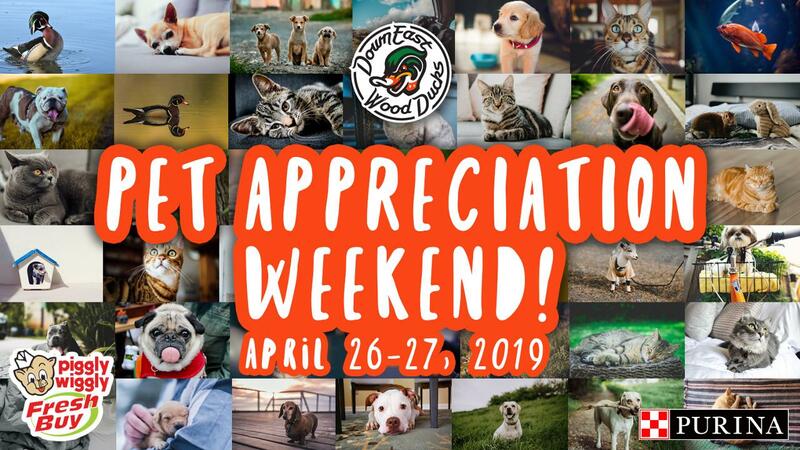 "The Pet Appreciation Weekend is an expansion of the Bark and the Park program we have hosted the past 2 years and we are looking at additional ways to grow the program and hope to have more exciting news in the months to come". The Wood Ducks had previously announced that 2019 Season Tickets are on sale. Reserved Grandstand season tickets are available for $370 per seat and includes tickets to all 71 home games. Season tickets can be purchased online at www.woodducksbaseball.com, by calling the Wood Ducks Team Offices at 252-686-5172 or in the Wood Ducks Team Offices located at Grainger Stadium (Mon-Fri - 9am-5pm).